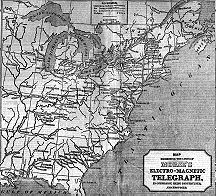 This site contains several articles that focus on U.S. Telegraph-History. The majority of these articles first appeared in the "Key and Telegraph"
images and illustrations. Some have evolved into comprehensive sites. and inventors. Certain new articles will be added here in the future. An article and web site that lists U.S. telegraph manufacturers that were in operation prior to 1918. Also included are over 415 manufacturer ads with notes about the companies and people associated with them. Charles Williams Jr. was an important telegraph instrument manufacturer. But, it was the experimental apparatus built at his machine shop that became historic for the U.S. telecommunications industry. His Boston factory is considered the birthplace of the telephone. 19th century telegraph instrument maker and inventor for The American Telegraph Co. and Western Union. Telegrapher, inventor, and manufacturer best known for his invention of the Vibroplex Bug. The Western Electric Manufacturing Co.
Washington and Baltimore in 1844.
of telegraph instruments in the United States. Bunnell companies that merged in the early 1900s. telegraph in U.S. railway service. Engineer, inventor, telegrapher, explorer, writer, and an early partner with Thomas Edison. a snapshot of its progress as of 1872. 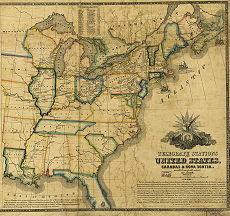 United States during the 1850s. his work in printing telegraphy. Was it Really Introduced in 1888? emerging semi-automatic telegraph key market. telegraph key used in the U.S.
New York - June 10, 1871. An article that covers the history of two prestigious telegrapher organizations. The Origin of the Word "Bug"
L. G. Tillotson & Co.
E. S. Greeley & Co.
telegraph manufacturers during the 19th century. Their business growth was directly influenced by the expansion of the U.S. railroad industry. An illustrated catalog of telegraphic and electrical instruments by Thomas Hall of Boston, MA, published in 1881. A catalog of telegraph instruments by the Bunnell Telegraphic and Electrical Company of New York, NY, published ca. 1901.